Field service and maintenance specialist CP Automation has announced a service and repair technique for DC drives, attached to permanent magnet motors, that is set to make in-house re-setting of the serviced drive a thing of the past. The technique dispenses with the use of a ‘keeper’, which normally acts as a substitute for the armature in the servicing procedure. Instead, the company de-magnetises the motor before repair and then re-magnetises it afterwards to the correct setting. 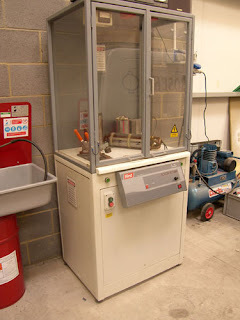 The company utilises a set of specialist tools, including a magnetising cabinet, as well as intellectual property built up over decades in the drives industry to apply the new technique. The reason that the settings on DC drives attached to motors that have been serviced or re-wound in their lifetime are often incorrect is that there is something unique to be borne in mind when repairing or servicing a DC permanent magnet motor. The standard philosophy within the rewind industry is to remove the armature and replace it with a ‘keeper’; to stop the levels of the magnets degrading. However, older magnets, and the material used to manufacture some newer magnets, will degrade while the armature is being removed and the keeper is being put in its place. The same applies when the armature is put back in after repair or service. The result is increased RPM and lost torque, which may mean the motor draws more current, costing money and creating a greater environmental impact. If the CPA process isn’t used, an in-house engineer has to re-set the DC drive to cope with the changes to the motor. As a result, all the systems in the plant eventually become unique and cease to be interchangeable. The only solution is to de-magnetise the motor before repairing it and then re-magnetise it to the correct level afterwards, as CP Automation does. The company derives the calculation for this from the speed and EMF (Electro Motive Force) settings on the name plate of the motor.